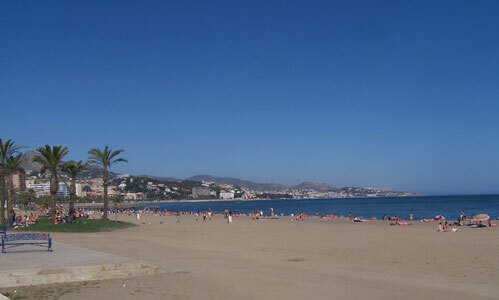 The Costa del sol's beaches are the major attraction for our visitors. Internationally-renowned sands with a clear water, secluded coves and stony beaches make up the Costa del Sol's beautiful natural landscape. These are long, wide (average of 30-45m), sandy beaches with siliceous carbonate substrata and average slopes of 14%. Together they are 15km long, and include El candado, Las acacias, baños del carmen, La Malagueta, San Andrés, Misericordia, Guadalhorce, and Guadalmar. At present work is underway on the Antonio Machado Seaside promenade and its extension to Guadalmar, which will then connect to the western side of the Costa del Sol. In the area of Guadalmar there is a clearly marked beach for nudists. The many blue flags awarded by the European Union are a garantee of the high quality of our beches, which are famed both for their cleanliness and for the services and facilities they offer. Cervantes Study Spanish Abroad Group or private lessons, lodging and many specialized programs in Malaga. The best way to learn spanish abroad.